Your mouth needs to be healthy in order for your smile to look great, your teeth to work properly, and your life to be free of dental pain. 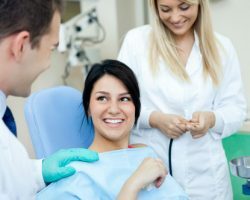 Sometimes, that requires a root canal, which can be the worst possible news patients hear if they believe all the myths surrounding this dental treatment. Today, our team at Times Square Dental wants to help ease your mind about root canal treatment in our Boise, ID dental office! At all times, your mouth contains good and bad bacteria. A root canal is necessary when the bad bacteria behave… well, badly. When harmful bacteria is able to get inside your tooth, it can lead to a potentially dangerous infection that needs to be eradicated. Basically, a root canal procedure treats any bacterial infection that’s taken hold of the inside of your tooth where your blood vessels, nerves, and dental pulp are. It’s a process where the infection is removed, the area is cleaned, and the tooth is reinforced by some sort of restoration, commonly a dental crown. You’ve no doubt heard some of the myths about root canals, but here are three quite common bits of fiction surrounding this particular treatment we want to set straight today! Maybe this myth has some measure of reality in its roots if you’re talking about root canals from bygone days. But it’s 2018, and frankly, nearly all dental procedures have changed for the better thanks to technology and modern numbing methods! A root canal is one of those improved procedures, especially at Times Square Dental. We numb the area so you won’t feel anything, and you can even rely on any of our dental sedation options if you need help feeling relaxed. It’s rather startling how long this myth has endured. That’s because it’s over a century old! It most likely stems from a study published by one, solitary dentist who insisted that root canals cause cancer, among other health problems. His conclusion, according to the study, was that clearing out infection from the inside of a tooth only worsened it for some inexplicable reason, but that’s a myth we can easily debunk. Clearing your mouth of potentially dangerous infection is good. Doing nothing to treat the infection and possibly allowing it to spread is bad. Pretty easy logic to follow, right? Root canals keep you healthy. It really is that simple! After we’ve cleaned the infection and sanitized the treated area, we’ll either use a material called gutta-percha or rely on a dental crown to place over your tooth. The point of this final step of your root canal procedure is to strengthen your tooth after treatment so it’s safe from future damage or infection. So it’s not the root canal that makes a tooth weak, but the infection that makes your tooth weak, brittle, and susceptible to breakage. If you ever need a root canal, you should know you’re in good hands with Dr. Hastings and Dr. Dial at Times Square Dental. We will make sure you’re comfortable during your treatment, from start to finish. With our dental sedation, cozy chairs, and ceiling-mounted TV’s, you’ll be relaxed and distracted while we work on getting your mouth healthy again! Call our Boise, ID dental office today at 208-278-1069 fill out our convenient online form to schedule an appointment. DentalROI provides relevant dental content to help providers educate patients. The statements, services, and products referenced in this article have not been evaluated by the Food and Drug Administration, and they are not intended as a substitute for professional medical advice, diagnosis, or treatment. Always seek the advice of your dental provider with any questions or issues you may have. Specific recommendations may vary in different circumstances, so individual consultation is important. Please login to publish a comment.